Thank you to the many alumni and families for participated in Judson's Homecoming 2018, held Sept. 27-29. Below are the activities, speakers and individuals recognized during Homecoming 2018. Worship was led by Graveyards to Gardens (Aaron Andries '15, Jeremy Yap '16, Tim May '13 and Josiah Vik '18) and an inspiring message from our Alumnus of the Year Heather (Funk '95) Palacios from Coral Springs, Fla. 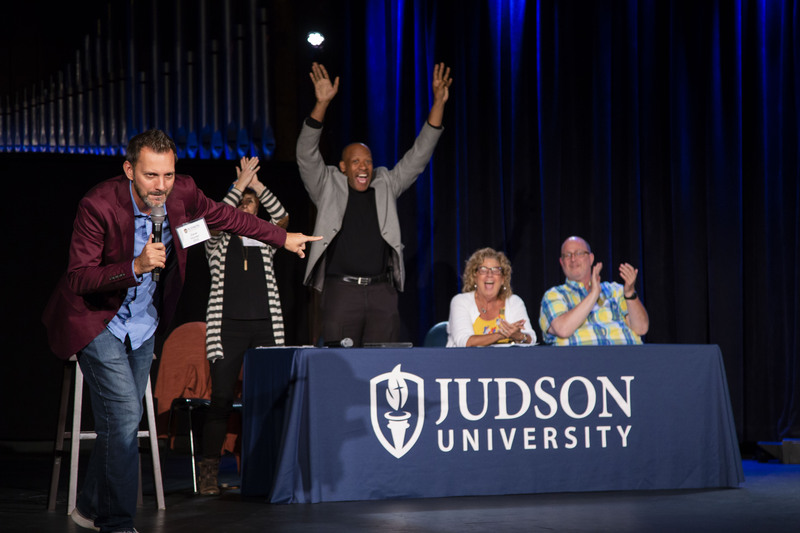 Host Dave Hunter ’02 will lead our Family Feud of the Faculty Family VS the Alumni Family through an evening of laughter, fun, stories, poignant moments and perhaps even a few tears in a night we call Judson Unscripted. Alumnus Matt Koehling '10 threwn down a Disc Golf Challenge between the Wilson Hall Alumni and the current Wilson Hall students. Alumni reunions were held for Reunion Years ('68, '73, '78, '83, '88, '93, '98, '03, '08, '13, '18) and Doc Ryder was recognized with a 50 years of Judson Service.The Distinguished Alumni Awards were presented to Kevin Svensen '06, Beverly Calender-Anderson '75 and Raul Rodila '95. The Alumnus of the Year Award was presented to Heather Funk '95 Palacios and we will be presenting the Family Legacy Award to the Dr. Richard Clossman family.